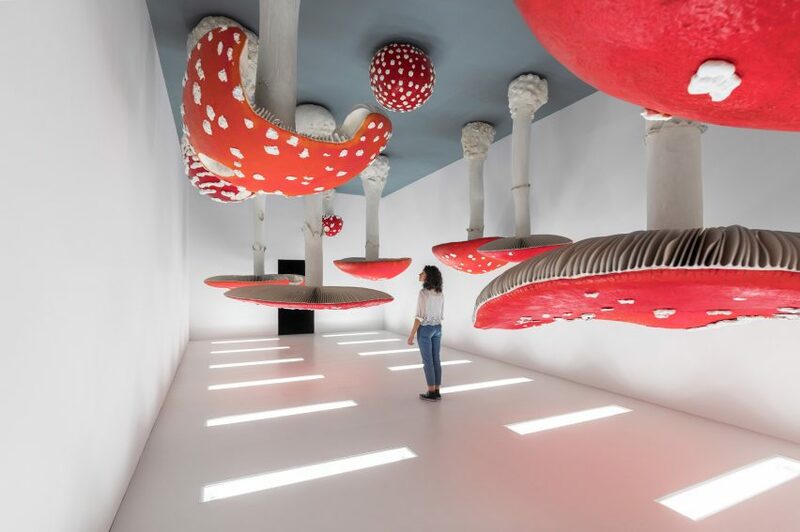 A room filled with giant spinning mushrooms and a set of bright yellow-green bathrooms are among the surprises found inside the OMA-designed Torre, which opened last week as the final part of the Fondazione Prada arts complex in Milan. The white concrete structure that towers over the converted industrial site in the south of the city began welcoming the public from 20 April 2018, coinciding with this year’s Milan design week. 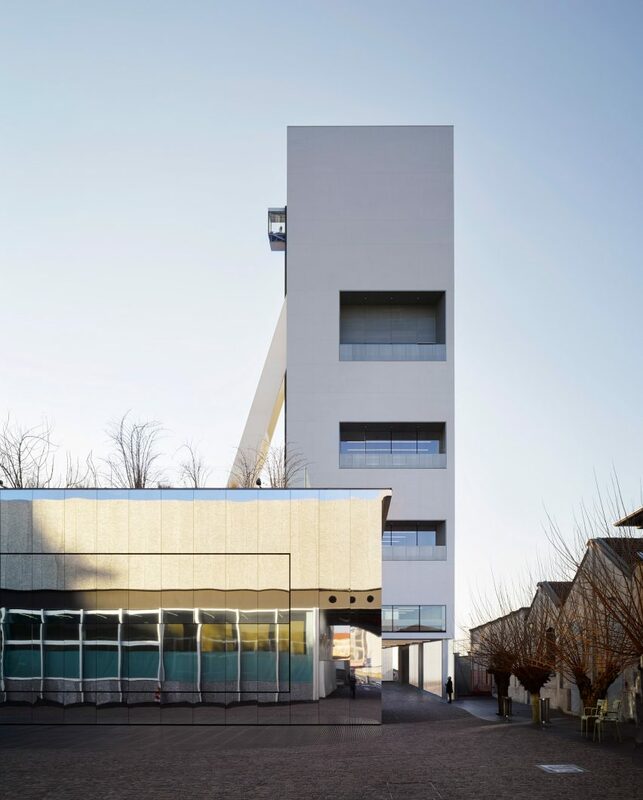 It marks the completion of the arts centre, which architecture firm OMA’s Rem Koolhaas, Chris van Duijn and Federico Pompignoli have overseen with fashion brand Prada founder Miuccia Prada. The first groups to explore the newly opened portion have been treated to works by some of the world’s best-known contemporary artists, and were able to explore the building’s quirky interior spaces. Entering from a plaza, past a row of thin transparent columns, visitors are faced with giant elevator doors. Inside, the lift is half lined in marbled pink, while the other half is almost entirely glazed. This enables panoramic view across the complex’s tiled roofs and instantly recognisable gold building, once the box emerges from a diagonal shaft that supports the tower. On the top of the 60-metre-high tower is a roof deck that offers even better views across the city, and features mirrored balustrades, a black and white floor, and is equipped with a bar for hosting events. Below, gallery spaces with pale wood floors and white walls occupy six of the building’s nine levels. Some are rectangular in plan, while others have a trapezoidal shape. 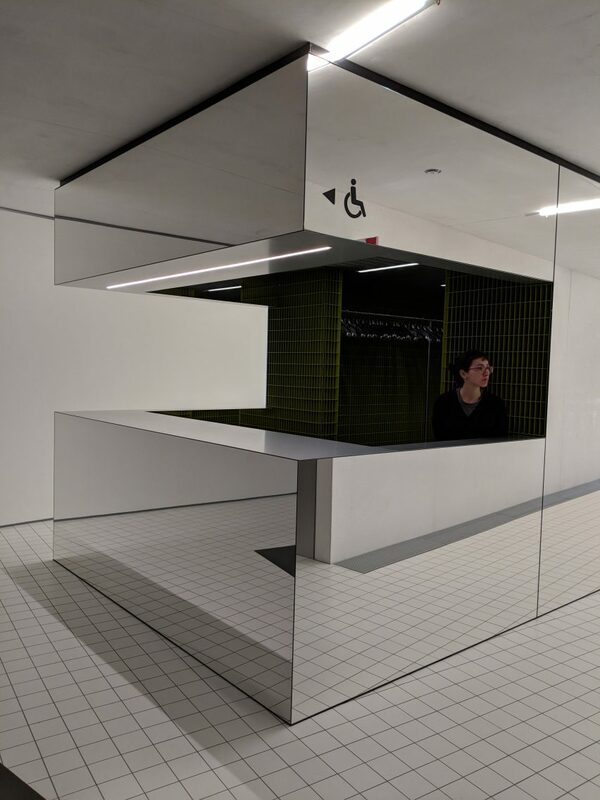 “Together these variations produce a radical diversity within a simple volume – so that the interaction between the spaces and specific events or works of art offers an endless variety of conditions,” said Koolhaas. The ceiling heights increase from bottom to top, from 2.7 metres on the first floor to eight metres on the top level. 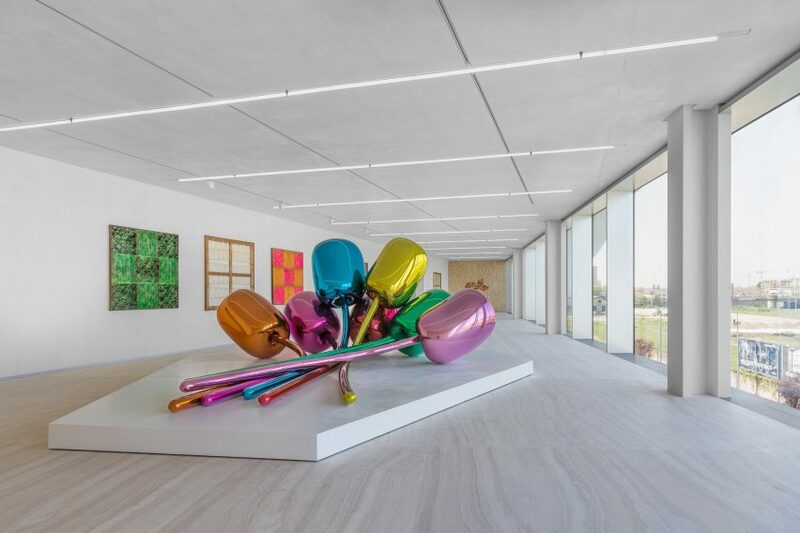 Artists represented in the Torre’s debut exhibition sequence, titled Atlas, include Jeff Koons, Walter De Maria, Damien Hirst and John Baldessari. “The group of exhibited artworks, realised between 1960 and 2016, represents a possible mapping of the ideas and visions which have guided the creation of the collection and the collaborations with the artists that have contributed to the activities of the foundation throughout the years,” said a statement from the foundation. Highlights include two combined installation works by Carsten Höller from 2000. Visitors traverse his pitch-black Gantenbein Corridor, using a handrail for guidance, before emerging into the pink Upside Down Mushroom Room. Inside, giant artificial mushrooms of various shapes and sizes hang from the ceiling and spin around at different speeds. Connecting the gallery levels are a pair of parallel staircases that pass each other in opposite directions, separated by glass walls. 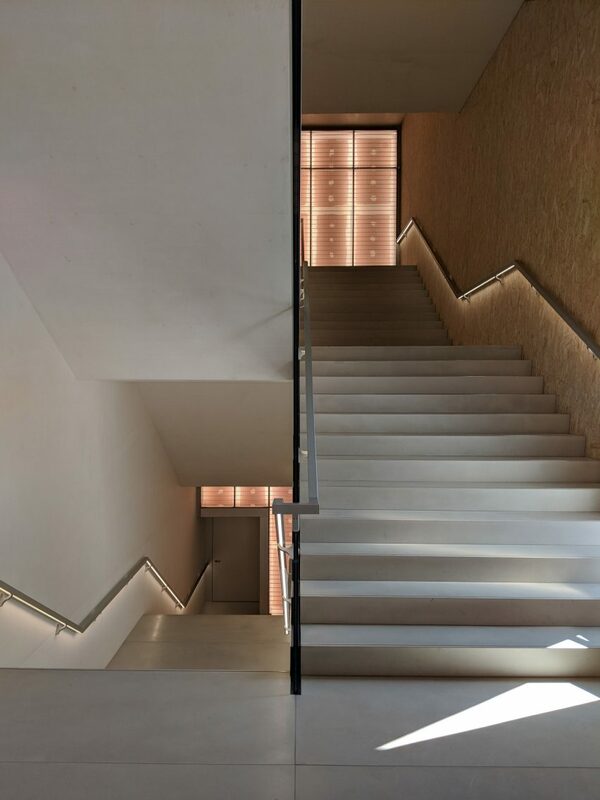 Undersides of handrails are illuminated by hidden tracks of lighting, while the gridded landing walls glow with a pinkish tint. Other spaces in the tower include a restaurant, also called Torre, on the sixth floor. The Italian eatery is furnished with pieces obtained at last year’s auction of items from Philip Johnson’s Four Seasons restaurant in New York, elements of Höller’s 2008-2009 The Double Club installation in London, and various other artworks. The restaurant also opens onto a terrace, formed by a triangular slice cut from the building’s rectangular form. The building’s most decorative interiors are its bathrooms. Close to the top, deep red tones are used inside the lavatories. 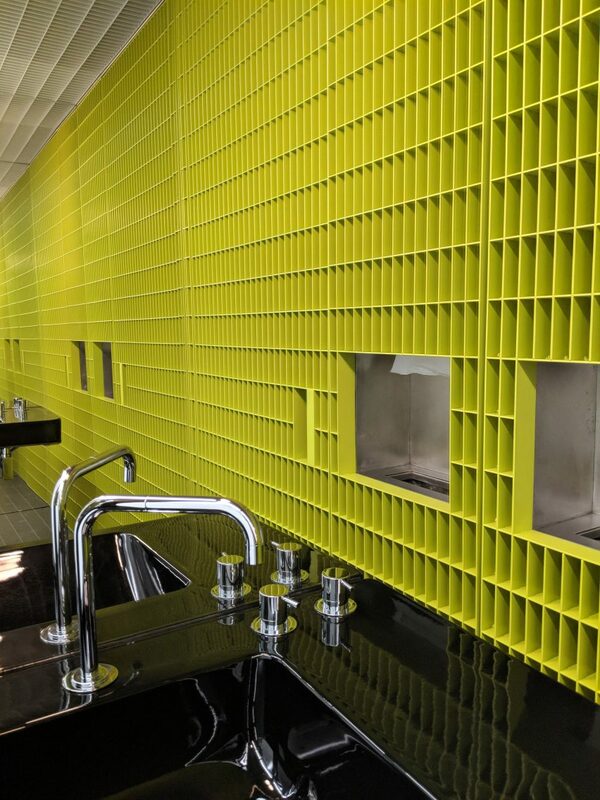 Meanwhile, the mirror-clad cloakroom towards the base of the tower conceals washrooms with bright chartreuse walls and black fixtures. The Fondazione Prada was launched in 1993, as an organisation dedicated to cinema, design, architecture, philosophy, fashion and performance. The creation of its home involved the renovation of seven industrial buildings, formerly used as a distillery, and the creation of three new ones – including the Torre. The complex opened its doors in 2015, and has been credited by critics and designers with helping to transform Milan’s cultural scene. OMA was an obvious choice for the project, as the firm and Prada have a longstanding relationship that goes back over 25 years. The architecture studio has completed a handful of store interiors for the fashion brand, as well as multiple set designs for its catwalk shows. 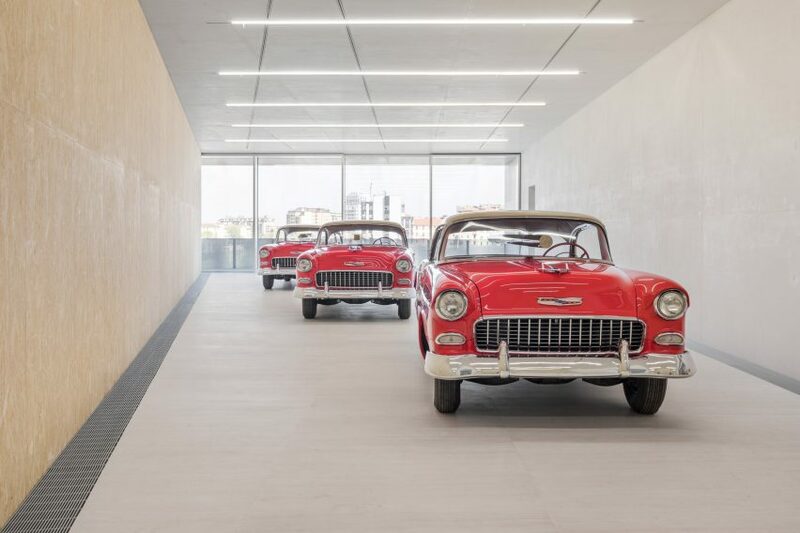 Installation photography is by Delfino Sisto Legnani and Marco Cappelletti.